George Washington was the leader of the Continental Army, guiding the country to freedom, but his role didn’t end after the Revolutionary War. 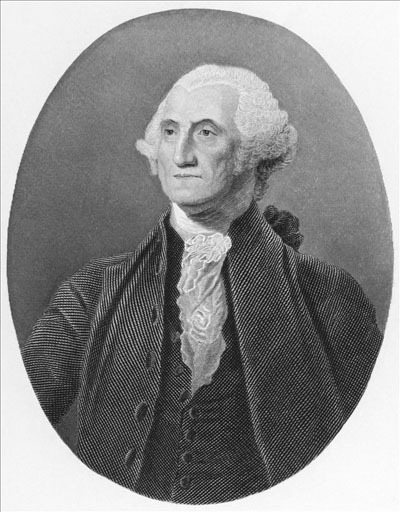 George Washington was so beloved that he was unanimously voted the first President of the United States. He served for two terms (eight years). He had given almost his entire adult life to his country’s service and was relieved to finally retire from public life. As final advice, he warned of the dangers of party politics (Democrats and Republicans), and urged the country to be self-reliant, steering clear of any permanent alliances with other countries. This was good advice, but from the beginning, few followed it. The Constitution was written by men who had seen the unhappiness powerful and corrupt leaders can bring to their people. The Constitution was designed to protect liberty. From the beginning, though, many people, such as Alexander Hamilton, saw the Constitution has a guide to be loosely followed. Hamilton and his peers wanted a more powerful federal government. Thomas Jefferson believed in strictly following the Constitution, giving the government only the powers described in that document. By 1800, political parties had formed, despite Washington’s warning. The Federalists, which included John Adams, James Madison, and Alexander Hamilton, wanted a strong central government. Republicans, such as Thomas Jefferson favored limited governmental power. Today, Democrats generally favor a strong government, while Republicans still want a limited federal government. Beloved: someone or something that is loved, treasured, admired, or cherished. Alliance: a relationship or union, usually between countries or organizations, which benefits both parties. Question: Was Washington D.C. always the nation’s capital? Answer: The Continental Congress met in Philadelphia but after the Revolutionary War, leaders needed to choose a capital. Alexander Hamilton and others wanted the capital to be in the north. Thomas Jefferson wanted it to be located near the south. A compromise was agreed to and George Washington chose the exact site for Washington DC. Maryland and Virginia each gave some of their land to form the city, which would be a special place, different from all other states. Visit Scholastic to learn more about political parties. Declan, Tobin. " Early Federal Government and Political Parties - American History ." American History for Kids, Apr 2019. Web. 22 Apr 2019. < https://www.americanhistoryforkids.com/early-federal-government-political-parties/ >.